Ever since I first heard of the Vz.58 around 2000, I was very interested and wanted to get my hands on one. For years nothing could be done about this as I live in America. A few years later demilled parts kits began to pop-up but at first no one was making receivers so what could be done with these kits? Some stores began offering Vz.58 dummy guns, which is mildly neat but what good is a gun that doesn't fire, even if they were very cheap? Around 2005, the first semi-auto only Vz.58 rifles came onto the market for civilian ownership. They were built from parts kits using original barrels on a new US made receiver. They were made by Ohio Ordnance and came with a high price tag of $1,300-1,500.00. I was simply unwilling to pay that amount for a parts gun and also at that time I was a poor graduate student. Plus magazines and parts were not easily found... so I waited. In the spring of 2007, finally an affordable Vz.58 was offered. it was made by D-Technik of the Czech Republic and imported by Century Arms. It was only offered as a single-stack low cap sporter with thumbhole stock and black plastic handguards. The bayonet lug was milled off and the threads had a extension welded over them. All of this was done to make the rifle qualify as a sporting firearm under US import law. So I bought the Vz.58 Sporter from Century along with an armorer's kit and went to work. I received the rifle in march of that year and it took me until June to get it converted to accept standard 30 round magazines, install proper military furniture, and find/make US 922(r) parts, it needed 5 total. At the end of it all, after seven years of wanting one, I finally had my very own semi-auto only Vz.58 and it was absolutely great. Two years later and the D-Techniks changed importers and now CzechPoint is the exclusive dealer for them in the USA, and Century has contracted with Ohio Rapid Fire to build their own line of Vzs using parts kits and American receivers and barrels. So today there are two major sources and types of Vz.58s a person might purchase. Lets back up now though and answer why I loved the rifle from the beginning and why I was so thrilled to get one. Let's look at what the Vz.58 really is and what sets it apart from other 7.62x39mm military pattern rifles. Century Vz.2008 with late style front sight and furniture and with a modern sling. Click here for the full 2028x1521 image. The SA Vz.58 was adopted into Czechoslovakian military service in 1959 as the samopal vzor 58, or submachinegun model 1958. It was not inspired by or based on the AK-47. If anything, the Vz.58 is a further development of the German STG.44, of which many examples were left in Czechoslovakia following WWII. It replaced in service two standard issue firearms: the SA Vz.24/26 submachinegun chambered for the 7.62x25 Tokarev cartridge and the Vz.52 battle rifle chambered for the unique 7.62x45mm Czech cartridge. When development began in 1955, the Czech military made it clear it wanted a very lightweight and compact firearm that was capable of both semi-auto and automatic fire. Additionally, it wanted the weapon to fire from a open bolt, be able to use stripper clips, and achieve above average accuracy when compared to other assault rifles in the 7.62x39 caliber. Development began in 1956, at the Brno plant. It was soon discovered that the open bolt design had to be exchanged for a closed bolt system, if the rifle were to meet the accuracy requirements. Early prototypes suffered from reliability and durability issues, but in trials in Russia in 1957, Soviet officers pronounced the Vz had promise and compared favorably against the AK-47 and the then new AKM assault rifles. To not exceed the maximum weight requirement, the designers used a barrel of 15" length and built magazines from a light alloy. The SA Vz.58 retained its milled receiver, but every possible gram was shaved off it, and in the end the rifle with magazine weighed in just a fraction over what the Czech military specified. It was close enough however, and the go-ahead was given to enter into full-scale production. 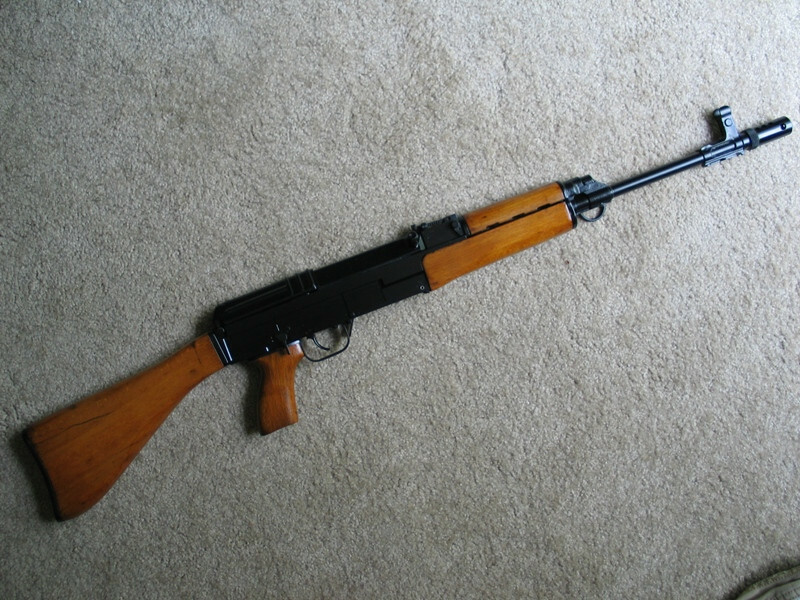 The SA Vz.58 was first issued in 1959 and continues to see service to this day. When the communist government fell in Czechoslovakia, the new nations of Czech Republic and Slovakia retained the rifle as their standard issue for their armed forces. Over its 50+ year service life, the Vz has seen only minor design changes; surely a testament to its designers' skill and forethought. In the late 1960s and 1970s, Cuba also purchased several Vz.58s for its soldiers. This isn't surprising as previously it had adopted the Vz.52 rifle as a standard issue. In total nearly a million SA Vz.58s have been produced, when counting all models and types. Please understand I am not an engineer and since I am blind, its a bit hard for me to describe mechanical appearances, but I want to touch upon a few of the rifle's unique features. Both the Vz.58's gas system and bolt lockup are completely different from the ones found in all AK-47/AKM/AK-74 pattern rifles. The Vz uses a falling breech block, somewhat like the locking system found in the Walther P.38 handgun. This system means the actual bolt only travels forwards and backwards. it does not rotate or tilt. Instead a pair of lugs behind the bolt fall into place when weapon is in battery and they engage two locking shoulders, which are milled into the receiver. When the weapon is fired, the bolt carrier travels rearwards a small amount before a ramp engages the breech block and lifts the lugs out of the receiver, thus allowing the bolt itself to begin its travel and extracting the empty casing. The ejector is a fixed piece milled into the receiver which passes through a groove at the bottom of the bolt. The empty case is thrown up and out through a very large ejection port, again some what like the one on the Walther P.38, K.43 and STG.44. The designers chose this style of lockup for increased accuracy and more reliable extraction and ejection. The gas system uses a short-stroke piston, which is not attached to the bolt carrier in any way. Instead it is pushed rearwards by gas from a port in the barrel, strikes the carrier and is returned to its original position by a spring. The piston is easily reached by removing the upper handguard and can be removed with no tools at all for cleaning or repair. Instead of using a hammer to strike the firing pin, the Vz uses a striker system. The designers felt the striker was both more reliable due to fewer parts and had a slower rate of fire in fullauto. The firing pin itself is floating. The selector on the military version operates as follows: forward = automatic, vertical = safe, rear = single shot. On the D-Technik sporter, middle is still safe and forward is single shot. On the Vz.2008, rear is single shot and middle is safe, forward is blocked off. Sights are of standard adjustable rear and front: notch and post with sight protectors. Barrel uses a 14mm thread pattern with a right-hand twist. Note this is reverse from the standard AK thread pattern, which has a left-hand twist. The bayonet mounts under the front sight base and to install it one comes from behind, sliding it forward until it locks. The stock is held on by a single large screw, usually lock-tighted in place. Magazines hold 30 rounds of ammunition and are ribbed for strength. They feature a follower which engages a last-round hold open lever in the receiver. A stripper clip guide is cut into the bolt carrier, meaning magazines can be refilled from 10 round SKS or 5 round Vz.52/57 clips. Note that AK and Vz magazines are in no ay interchangeable. A D-Technik Sporter converted into a folding stock military design with early style front sight and early sling. Between the Vz.58's production run from 1958 until 1984, no major changes were introduced. However, several small ones did enter into the design. The first generation of rifles used beech wood stock sets. A Century Vz 2008 Sporter with wood furniture and Czech style brake. Beginning in the mid 1960s though, production had switched to a new style of furniture. This is the now common wood impregnated polymer mixture. it was felt the combination of wood and polymer would create a stronger and more durable piece, while at the same time save time and money. Color can range from dark red or brown, to a light almost orange appearance. Another noticeable change occurred with the front sight hood. Early models had a complete and closed hood, similar to the ones found on Mosin-Nagants. Later models featured an open-top style, like the ones found on many AK pattern rifles. A third change can be found with the front sling swivel. Early models used a sling swivel which looks nothing less than a key chain ring. Later models began using a stamped flat metal piece in the shape of a T and with a hollow middle for the sling to pass through. Finally, in recent years, the Vz.58 has been issued with a muzzle break, which is commonly called the 'beer can' and it has porting at the top. Before the use of this break, most Vzs just came with a muzzle nut on their threads, which was only removed if a blank fire adapter was called for. SA Vz.58P - Pìchotní (infantry) with fixed buttstock with a swept down angle. SA Vz.58V - Výsadkov (airborn) with a metal side-folding stock with fixed buttplate. Stock folds to the right via a push button on the bottom right side. SA Vz.58PI - Pìchotní s infraèerveným zamìøovaèem— (Night vision infantry) with bipod, conical flash hider, and mount for scope. Many other versions were thought up and even put into prototype phase, but none ever went into full scale production. As I wrote in the beginning, today there are 2 basic choices for a civilian legal Vz.58 Sporter. Both are built from new and used parts. Both are offered in either fixed stock or folding stock versions. Both can even be had with original wood stock sets. Here is a brief list of the proes and cons of each. Side-By-Side of the Vz.2008 (top) and D-Technik (bottom. SA Vz.58 Sporter - Czech made, original single stack only, some models have the magazine well milled out by Czech Point in the USA to accept standard magazines. Vz.2008 Sporter - US made non-chrome lined barrel of 16"
SA Vz.58 Sporter - Czech made 10 round clear plastic with low-cap, Surplus 30 round Magazine body with USA made plastic follower and floorplate with hi-cap models. Vz.2008 Sporter - Surplus magazines, no US parts required in magazines. I hope I've been clear and that this has been useful to someone.